The following email was received 31 Jan 2017 from NRT about the Cheltenham Services facility. Note that this is not the new club house, we expect to be using the demountables for the next 2 seasons. Welcome to the Northwest Rapid Transit (NRT) consortium’s Sydney Metro Northwest email update for Cheltenham Services Facility. These updates will be distributed monthly to keep you informed about project activities in the Cheltenham area. 2017 is set to be a busy year for the services facility team at Cheltenham. After several months of preliminary work and a short break over Christmas, the team has been working on concrete piling to form the building foundations. 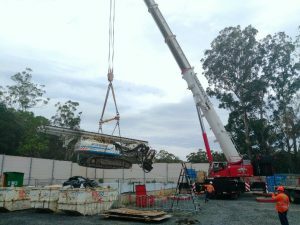 A 400-tonne mobile crane lifted a piling machine and an excavator more than 20 metres down into the shaft. The machine was used to drill 40 piles to create the foundations for the facility building. Since the first pour of concrete in December last year, piling for the foundations has now been completed. An estimated 170 cubic metres of concrete has been used in the creation of the 40 piles. This year the team will focus on delivering structural works for the services facility, with demolition of the old council storage shed scheduled to start in mid-2017. If you do not wish to receive these emails, please reply with UNSUBSCRIBE in the subject line. Should you wish to make a complaint or obtain more information, please phone 1800 019 989 (24 hours a day, 7 days a week), email us at trains@nullmetronorthwest.com.au or visit www.sydneymetro.info. Thank you for your patience and cooperation while we carry out this important work.